The Canadian Podcast Listener, the second annual iteration of a survey into the podcast consumption habits will be released at the inaugural RAIN Summit Canada. Audience Insights and The Podcast Exchange have shared some top-line results ahead of the October 10 event. 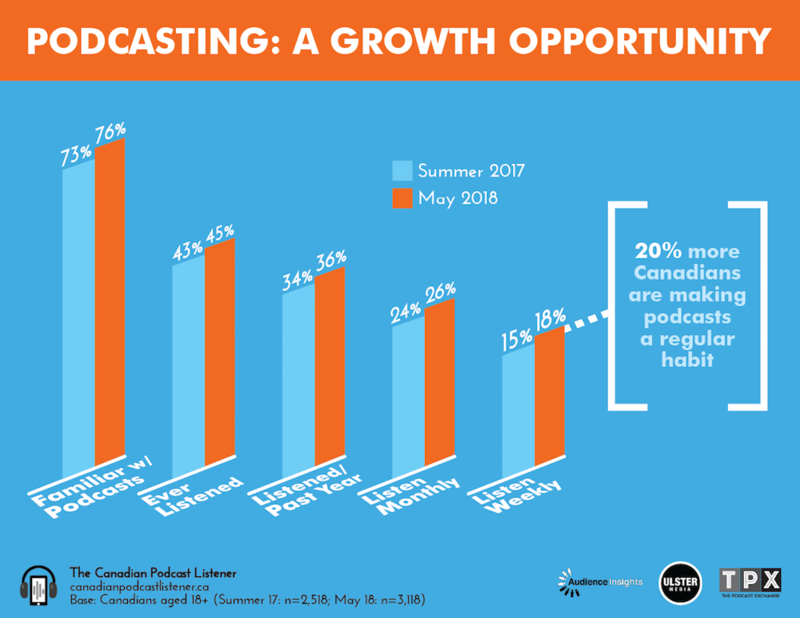 The initial calibration survey of more than 3,000 Canadian adults revealed growth in most of the major statistics for podcast listening. Familiarity with podcasts grew from 73% in summer 2017 to 76% in May 2018. The portion of respondents who had ever listened to a podcast edged up from 43% to 45%. A growing number of Canadians are incorporating podcasts into their regular routines, with 20% more of the population making it a weekly habit. The final results will include many more statistics and insights into Canada’s podcast audience. Respondents who identify as monthly listeners are asked about the shows they listen to, meaning The Canadian Podcast Listener has a snapshot of what programs are most popular.